Looking through our blog archives, I came across a post about marketing by AnnMaria on how companies market their products to be something that they are not because they “sell the sizzle, not the steak.” This reminded me of my high school prom dress. I found a dress online that looked beautiful on the model and was described using every prom dress buzzworld a high school girl would want to hear. Since it was a reasonable price, I ordered it right away. But I was immediately disappointed when the dress came in the mail. The fabric was cheap, it didn’t run true to size, and it looked nothing like it did on the model on me. The same situation can happen when it comes to buying educational games. You may think you’re buying a great game for your students or kids because the company tells you all these great things about it or makes it appear awesome. But in reality, your kids may not enjoy playing it, it may not effectively teach, and it might not run properly on your hardware. You feel ripped off, just like how I felt after I bought my prom dress. If there is one thing I learned from working at 7 Generation Games, it’s that you want to sell the steak, not the sizzle. It’s important to establish trust between your brand and your consumers and making your products out to be something they aren’t, isn’t the way to do that. Here are 5 ways to market your products without fooling your customers. 1.) Focus on building the product before marketing it. It’s important to spend all the time and energy you can on making your products the best they can possibly be before developing a marketing strategy for them. At 7 Generation Games, we don’t heavily promote a new game until it’s ready to sell. 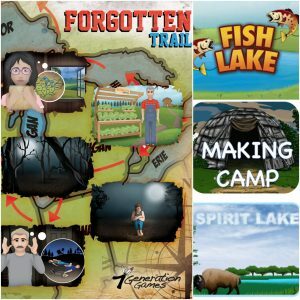 While we’re releasing Making Camp Premium this summer, you won’t see it all over our social media pages until we are confident that the game is complete. 2.) Provide demos or product previews. One way to build trust between your brand and your consumers is to provide sneak peeks for the products themselves. Demos or product previews let your consumers know what they are going to get before they make the purchase. You can get free demos for our games here. 3.) Encourage customer reviews and feedback. We encourage customers to give us feedback on their experiences with our products. We want costumers to rate our games and resources on the Microsoft and Apple Store, Steam, GooglePlay and Teachers Pay Teachers. We also love when followers comment on our social media or blog posts. Customer feedback is helpful for determining what works and what doesn’t. You should never pretend your product does something it does not for the sake of marketing. While parents often say their kids are the best at everything and the smartest, even when they aren’t, this isn’t okay in the marketing world. (Parents aren’t trying to get people to buy their kids). It’s important to come up with catchy phrases about your products that customers will remember, but these statements should be true. For instance, we say that we make “games that make you smarter” because we have the numbers to back up why that’s true. Numbers don’t lie. Running studies on your products can help you gather data about your products that you can use in your marketing strategy. We ran a pilot study with our games and found that they raised math scores by 30% or more. Our games also come with pre-tests and post-tests so teachers and parents can track their students/kids progress. Want to buy educational games that you can trust? Get our games here.